At #DIGEX2019 GeoTeric presents their fault delineation process using deep learning. “The application of deep learning for more accurate fault delineation” is the full title of the talk which will be given by James Lowel, Research and Development Director for GeoTeric at #DIGEX2019 in 2 weeks time at Gardermoen, Oslo. He presents improvements to the way we interpret faults. First of all there is the traditional way of manually picking fault sticks, which is time-consuming, subjective and often also low resolution. As an alternative, using seismic attributes for fault interpretation can be very effective. However, one of the issues with objective attribute analysis is the amount of noise that is detected in the attributes. All edges are identified, and it can be difficult to distinguish between faults, processing artefacts and stratigraphic edges. The use of deep learning technology provides us with the potential for a much faster and more accurate fault delineation process according to Lowel. 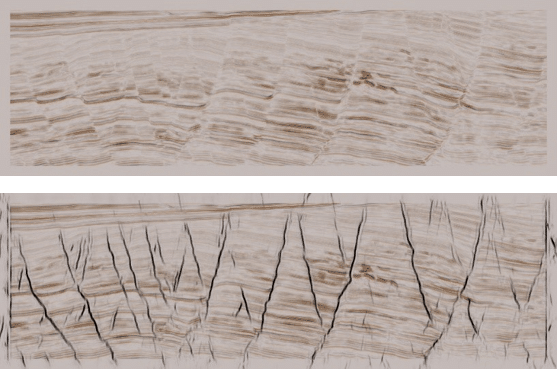 Results from GeoTeric’s research and development will demonstrate how deep learning algorithms can give clean and detailed fault interpretations that will augment and enhance the traditional interpretation workflows. If desired, automated interrogation of these deep learning volumes can be performed to deliver traditional fault interpretation deliveries, such as fault sticks etc. Congratulations! Very interesting studies. Certainty can help E&P interpreters to optimize time in fault interpretation.